Are you a senior in high school running for Student Council President? Are you an entrepreneur looking to make a successful pitch and attract investors? Are you a military officer working to win your men’s loyalty? Are you a salesman trying to land some new clients? Are you a college professor wanting to get through to your students? Are you a single guy looking for love? No matter your situation in life and your individual aims, one of the most important tools for success is your personal charisma. Charisma is what allows you to command a room, draw others to you, and convince people of your ideas. It’s an essential part of being the kind of leader who wins devoted followers who are willing to go to the ends of the earth for you. Charismatic men are perceived as both likeable and powerful, a dynamic, irresistible combination that opens endless doors to them. Charisma may seem like a mysterious quality — something that some men are born with and some are not. But this is happily not the case. You don’t need to have hit the genetic charisma lottery in order to develop yourself into a man with powerful magnetism. Far from being a magical and inexplicable trait, charisma can be broken down into a set of concrete, largely nonverbal behaviors that can be learned, practiced, and made natural. Olivia Fox Cabane, author of The Charisma Myth, places these behaviors into three categories: Presence, Power, and Warmth. When deftly combined, these three components produce strong personal magnetism. We will be devoting an entire post to each of these three components of charisma. Each will provide an overview of the component, as well as practical tips for developing and implementing it. Later on, we will cover charismatic body language, and, because not every “style” of charisma is appropriate for every situation, we’ll discuss what behaviors to use or de-emphasize in different situations. For today, we’ll start off by talking about the first component of charisma: Presence. Have you ever been in a conversation with someone and you could tell you didn’t have their complete attention? Sadly, it seems fewer and fewer people are fully present and engaged with the individuals they’re interacting with. Being completely engaged in a conversation has likely always been a challenge, as we all have a bit of the conversational narcissist in us. Now that smartphones have saturated modern life, being fully present is even harder. People today try to (unsuccessfully) switch their attention between two worlds — the real world populated by the people they are physically present with and the cyber world which sends them dispatches through their phone. Go to any restaurant in America and you’re bound to see tables of people staring blankly at their smartphones and hardly engaging with each other. This video that circulated the intertubes a few weeks ago perfectly captures the way in which technology has created a society of non-present screen gawkers. Pretty poignant. The good news about all this is that it’s now incredibly easy to set yourself apart from the pack simply by being fully present with people and giving them your complete attention. When you think of charisma, you might think of trying to make yourself seem super awesome to others. But the paradoxical secret of charisma is that it’s not about trumpeting your good qualities, but making the other person feel good about himself. Real charisma makes the other person feel important; when they finish an interaction with you, they feel better about themselves than they did before. Focusing your mental and emotional energy on someone as you interact is how you create that feeling of importance. People fundamentally want attention – they want to be recognized and acknowledged. And you don’t have to be an outgoing, uber-social extrovert in order to have and display charisma. In The Charisma Myth, Cabane cites tech-entrepreneur Elon Musk as an example of someone who has mastered the art of charismatic presence. He’s incredibly intelligent and a pretty quiet guy by nature; however, he counterbalances his introverted inclinations with intense focus and presence. He doesn’t need to be the extroverted life of the party to seem magnetic; instead of chatting everybody up and offering a little of himself to a lot of people, he concentrates on giving his full, intense attention to a few; in so doing, he makes them feel incredibly special. Charisma isn’t necessarily about quantity, but quality. 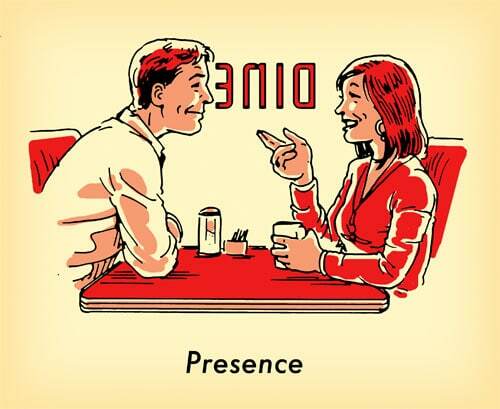 Conveying presence is a simple concept, but oftentimes difficult to actually achieve. You can’t just fake it. People are surprisingly adept at deciphering your feigned interest. To truly convey presence, you must actually be present. It takes a significant amount of willpower to focus all your attention on the person you’re with at the moment. But like all things, with practice, it becomes significantly easier. Bring yourself to the here and now. Presence begins in your mind. If you feel like your mind is off somewhere else while engaging with someone, try this little exercise to bring you back to the here and now. Focus on physical sensations in your body that you often ignore. It could be your breath or it could be the sensation of your feet touching the ground. You don’t have to spend very long meditating on these sensations. Just a second or two will bring you back into the moment you’re sharing with this person. Make sure you’re physically comfortable. It’s hard to be fully present with someone when all you’re thinking about is how uncomfortably tight your pants are or how hot it is. To that end, do what you can to ensure you’re as comfortable as possible. As Antonio has emphasized numerous times — wear properly fitting clothes! Besides helping you look better, clothes that fit well make you feel better. Other things you can do to increase your physical comfort include getting enough sleep, laying off the caffeine (be calm instead of jittery), and adjusting the thermostat (when you can) to a more agreeable temperature. Look the person in the eye when they’re talking. Numerous studies have shown that people who make higher levels of eye contact with others are perceived as possessing a load of desirable traits, including warmth, honesty, sincerity, competency, confidence, and emotional stability. And not only does increased eye contact make you seem more appealing in pretty much every way to those you interact with, it also improves the quality of that interaction. Eye contact imparts a sense of intimacy to your exchanges, and leaves the receiver of your gaze feeling more positive about your interaction and also more connected to you. It’s important to note that while eye contact works well in building intimacy in friendly situations, recent research suggests it may backfire when you’re trying to persuade someone who’s skeptical of your point of view. To learn more about the importance of eye contact, click here. To learn how to make eye contact the right way, click here. Nod to show that you’re listening. Besides eye contact, an easy way to convey presence is through body language, and more specifically, nodding your head. But be judicious with the noggin nods. An over abundance can indicate you’re trying too hard to please and agree with the person, which decreases their perception of your power. Also, only nod at appropriate times; you’ll need to be truly listening to know when a nod makes sense. In more casual conversations, ask people questions like, “What was your favorite part of that?” or “What was the hardest part of that for you?” People really enjoy reflecting on and answering such questions. For more info on how to ask questions that show you’re really listening, click here. Avoid fidgeting. Fidgeting signals to the other person that you’re not comfortable or content and that there’s somewhere else you’d rather be. So don’t twiddle your thumbs or your phone. And avoid looking around for what else is going on, which signals to the other person that you’re searching for a better opportunity than your current one. Don’t think about how you’re going to respond while the person is still talking. We all have a tendency to do this. Our inner conversational narcissist wants to be ready to jump in and start talking as soon as there’s an opening. But if you’re thinking about what you’re going to say, you’re obviously not fully listening to what the other person is saying. It’s natural to want to have an idea of what you’re going to say before you say it, but it’s okay to work through your response as you’re giving it; embrace the pause. As we’ll discuss in the article on Power, it’s low-status individuals that talk the most and feel the need to fill every silence. When someone has spoken, see if you can let your facial expression react first, showing that you’re absorbing what they’ve just said and giving their brilliant statement the consideration it deserves. Only then, after about two seconds, do you answer. Bone up on your other listening skills. Make sure to check out our post on active listening for more tips on improving this vital skill. Follow them and you’ll make vast improvements in your charismatic presence.